Unfortunately, all I seem to recall as time screams by is that Mesopotamia known as The Split, as ’96 is the year that CART billed itself as the premiere Open Wheel Racing series, as I still recall the phrase: All the Stars vs. All the Cars... Thus, sadly, I’m assuming I paid either very little or most likely no attention to the rookie driver Krosnoff, who was most likely a back marker aboard his Arciero-Wells Racing (Frank Arciero and Cal Wells collaboration)Reynard-Toyota – especially since it was Toyota’s inaugural Indy Car season – not to mention Arciero-Wells being ‘Juan of the Minnow’s on the CART grid. Thus, I seem to somewhat still vividly see that beautifully decked-out red & yellow MOMO corse Ferrari 333SP of Giampiero Moretti’s being driven at qualifying speeds during the last hour of that year’s Daytona 24hrs by a virtual unknown by the name of Massimiliano Papis! With Bob Varsha going GaGa over Papis’s breakneck speed whilst trying vainly to run down the eventual winners in the races final half hour. Thus was it here where Massimiliano ggained the moniker MAD MAX from his stellar runner-up finish? "We had huge shoes to fill," Wells said. "The team needed a driver who would continue Jeff's passion and commitment to his craft in the same uncompromising fashion Jeff did. We knew we could not replace Jeff, but we needed someone who would understand and emulate his mantra, 'Stay hungry.' Max has given that to us in and out of the car." "It was very difficult," Papis said. "The first time I sat in the car, I thought about Jeff, and now Jeff is not driving, he is not here. "It felt like someone else's car. The car was not mine. The car was Jeff's." 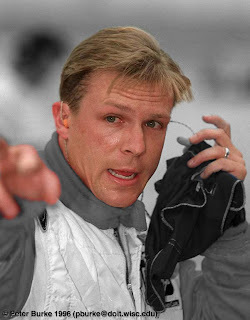 Thus, I suppose it’s somewhat symbiotic – although I find it more karmic that I stood in line for nearly two hours this year at Indianapolis Motor Speedway to get “Stevie Johnson’s” (Stefan Johansson) autograph. As it was the Swede no-less whom Krosnoff made wheel-to-wheel contact with upon that fateful day Up North Eh! "The thing that Max brings to a team is charisma," Rahal said. "Forget talent, because that's obvious, but there's charisma. Charismatic people drive things to a higher level through force of will. They're not afraid to take a stand, and I like that about him." We were watching the Brahma Bull and Paul Tracy! I recall we were thrilled by the Brahma Bull and antics of Paul Tracy's driving!